I also got to visit the S.T.A.R. Labs Mobile Research Unit promoting the TV show, which was fun, both for the exhibits and for the Allen case bulletin board. Check out Monday’s article for photos and a writeup of the exhibit. 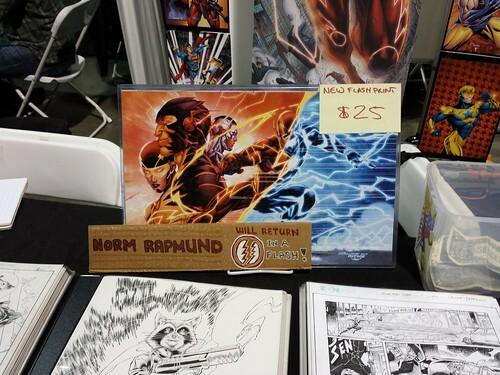 Finally, Norm Rapmund was selling these prints by Brett Booth and himself, featuring the major players in the current story arc. He was selling a limited edition (as in 25 copies!) of the uncolored image, and I was tempted. It looked really striking in black and white as well, but it was also twice as much, and I liked the way the present/future Barrys split the image into red and blue. Head over to K-Squared Ramblings for my full con writeup and photos! 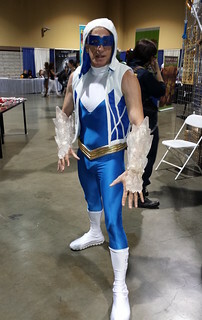 This entry was posted in Fandom and tagged Captain Cold, Cons, Cosplay, Jay Garrick, LBCC, LBCC 2014, Long Beach, Norm Rapmund on October 4, 2014 by Kelson. 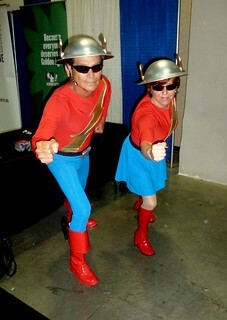 They look excellent, now I want to read about a Golden Age Miss Flash – or was there one? Not that I’m aware of, but there should have been! Though I’d be afraid it would be too much like Joanie Swift. Johnny Quick had a female counterpart for one story when a secretary copying a sheet of equations started reading them aloud and accidentally stumbled on the speed formula. It was a terribly sexist story, with Johnny Quick actively trying to stop her because he didn’t want competition from a girl, and she’s finally stopped when she sees a mouse and faints. When she comes to, she’s forgotten which formula gave her the speed. The story is reprinted in World’s Finest #198, which features one of the Flash/Superman races. Oh, I’ve not come across Joanie previously, thanks Kelson. 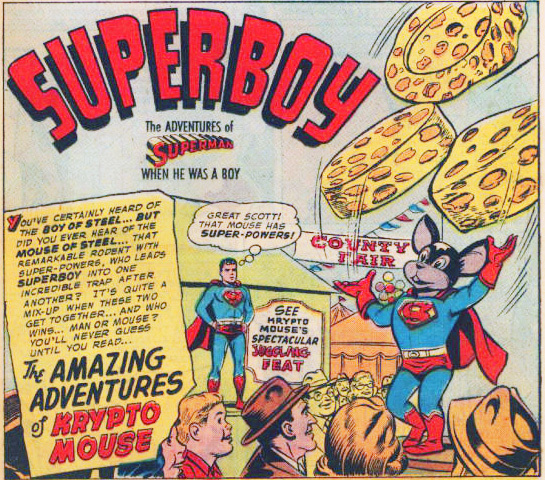 It’s a good job the mouse wasn’t Golden Age Superboy chum Krypto Mouse, he could’ve chased her at super-speed. I only knew about her because of the reprint. Why anyone thought it was a good idea to reprint that particular story for anything but historical reasons is beyond me. Reminder to self: never underestimate the goofiness of the Silver Age!